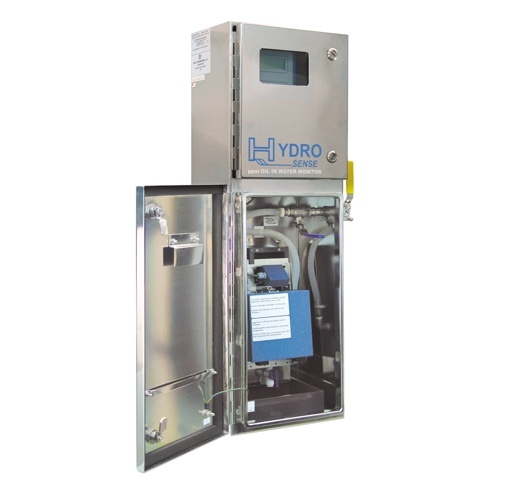 The HydroSense 2410 continuously monitors the water sample flowing through it for ppm concentrations of hydrocarbons. The display, signal output, and alarm can be configured within the 0-1000 ppm range. On-line monitoring for ppm concentrations of petroleum oils in effluent and produced water. The HydroSense 2410 uses a UV fluorescence technique to target the aromatic component of the oil contamination. Through a site calibration, this aromatic tag provides an indication relative to total oil. A continuous sample flow is tapped or pumped off the process line and directed through the HydroSense chamber. It passes behind the non-contacting UV light source and is targeted with filtered light energy. The soluble and emulsified oils in the water will excite from this light energy and fluoresce light energy back out of the water at a signature wavelength. The intensity of light energy at this wavelength is measured to provide an indication of the ppm concentration. On the 2410-U, an ultrasonic module assists for cleaning and homogenizing the sample. To ensure a long-term and reliable operation a routine maintenance schedule should be implemented. Arjay has made this operation quick and easy. The following are a few of the standard maintenance and design features built into every unit. The sensing chamber is hermetically sealed from the upper control unit. This not only keeps the control components dry but also allows keypad and wiring access without opening the sensing chamber. Operator clean time is less than 2 minutes and no tools are required for any procedure. Power or sample flow do not need to be turned off. Lamp replacement is equally easy. A sensor independently monitors the lamp life. The LCD display and a maintenance relay will warn of an impending need for replacement so an operator can schedule this replacement without any downtime. Full diagnostics are accessed on the LCD display. The system automatically compensates for temperature and zero calibration (offset) shifting due to lamp aging. The system automatically compensates for background or stray light energy. The controller reads the sample over 50 times per second and averages these readings to provide an updated output. The unique glass flow plate design provides a stable representative sample of the passing stream. Protect from direct sun or rain. Instrument shelter or indoor use is recommended. Air Conditioners available. Groups A,B,C,D, Zone 2. Pressurization/Purge available for use in Zone 2. NFPA/ATEX.